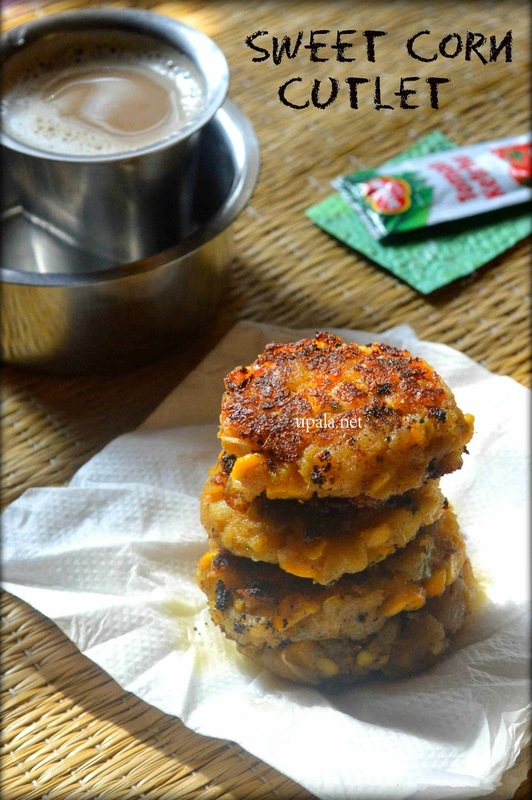 Sweet corn Cutlet is a yummy evening snack that goes well with tomato sauce. When kids stay at home, they love to munch on yummy snacks. Click here to get the snacks recipes, and I am sure it will help our dear mothers to make variety of snacks to their kids during holidays. 1) Cook the American sweet corn till soft and set aside. 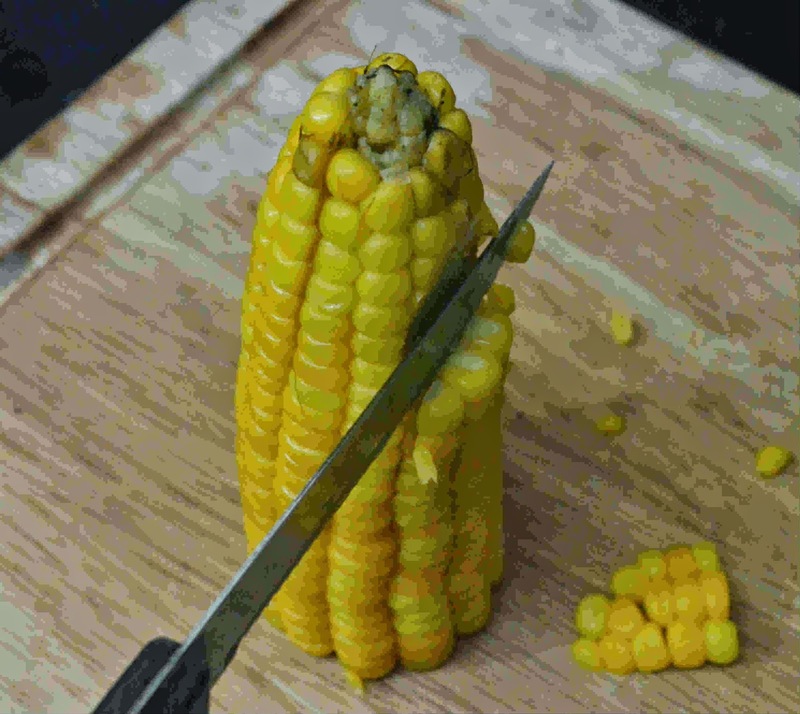 After it cools remove the corn kernels. Next pressure cook potato, after it cools peel the skin and mash it. 2) Heat oil in a kadai, add onions and fry till translucent. Now add Ginger Garlic paste and fry again. 3) Add Hing, Garam masala, Kitchen king, Chilli powder, Salt and mix well. 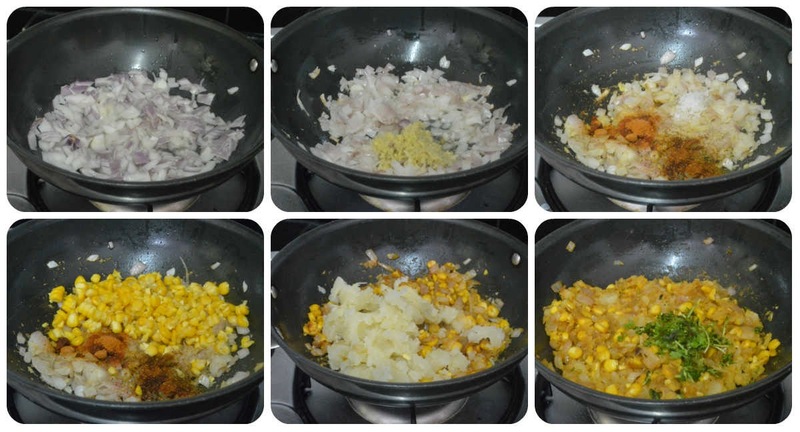 4) Now add the Corn kernels, Mashed potato and mix well. 5) Switch off the flame and add Coriander leaves. 6) Add Besan to this corn mixture and mix well. Now make equal size balls and flatten them all as shown in pic. 7) Heat a 2 tbsp of oil in Tawa and drop these cutlets in batches. After one side turns crispy, flip it around carefully to cook other side. Drizzle some more oil if needed. After both sides or cooked, remove them from tawa. 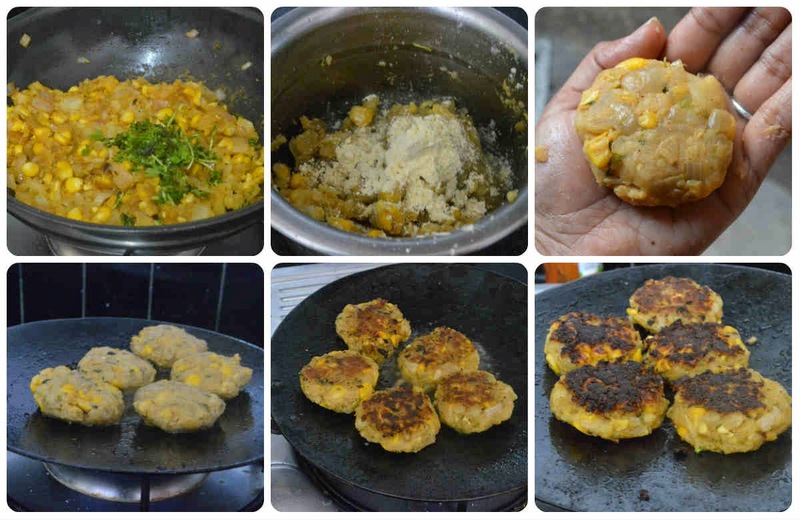 Yummy and Hot Sweet Corn Cutlet/Tikki/Patties are ready to be served with Tomato Sauce. 1) Don't worry if you hear light crackling sound when you cook the cutlets in tawa. This is because corn kernel pops when it gets heated up. If you want to avoid this, try dipping the cutlets in maida paste and bread crumbs like how we do for vegetable cutlets. For detailed procedure, click here. 2) Instead of Besan/Gram flour you can also add Rice flour or Corn flour or maida according to your preference. This flour acts as binding agent and avoid cutlet getting break while cooking. I made it 4 breakfast 2day..it was great.. My husband loved it.. thnx for sharing..